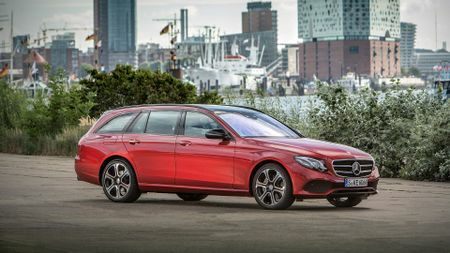 The E-Class Estate has always been first choice if you want the biggest boot. We test the new one to see if it’s still king of the load, and a match for the excellent saloon. 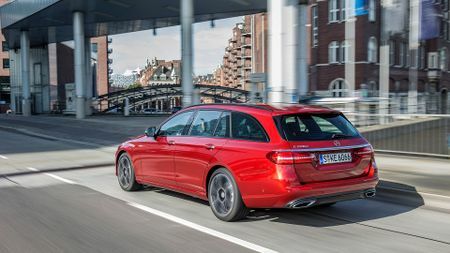 If you want an efficient, refined and cavernous family estate that’ll cope with almost every family eventuality, the E220d Estate is a great choice. It’s not cheap, and the options quickly stack up if you let them, but it comes well equipped, and eases the stress of travel like no other large estate we can think of. For that reason, it comes highly recommended. The answer to the prayers of antiques dealers across the land. Volvos used to be the cars of choice for ferrying old furniture from boot sales to auction houses, but the E-Class has upped its game. 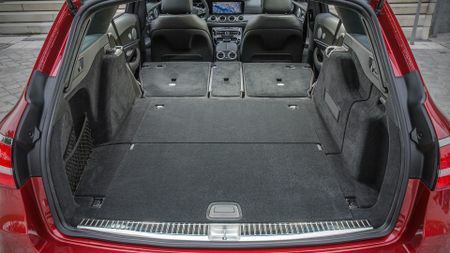 This is a proper estate – offering more space in the back than any other premium wagon. You can fit 640 litres of luggage behind the rear seats. Clip the seat backs into the steeper ‘cargo’ position and you can squeeze 670 litres in; fold them down entirely, and you get a mostly flat (and definitely cavernous) 1,820 litres of loading bay. 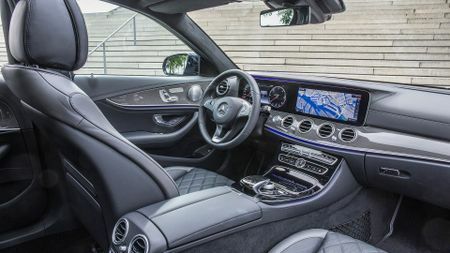 Besides the generous amount of room, the new E-Class Estate offers all the luxury, technology and efficiency the saloon does. 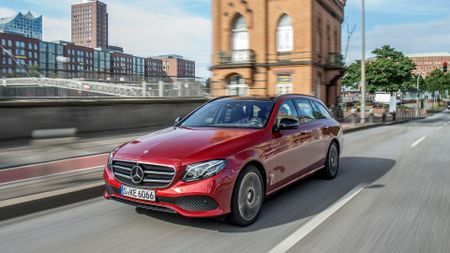 It has the same brand-spanking new 2.0-litre diesel engine, a cabin that sets new class benchmarks, and it comes in the same pair of trims: SE and AMG Line. We’re testing the sportier version here. A master class in practicality. 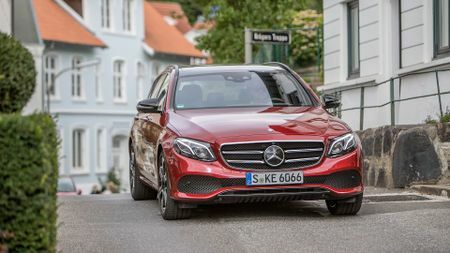 The E-Class has the sheer space to dominate its rivals when load lugging, but it’s the smaller touches that make this a great car for tackling all kinds of tasks. For example, every model comes with a powered tailgate, opening at the touch of a button to reveal that vast boot. 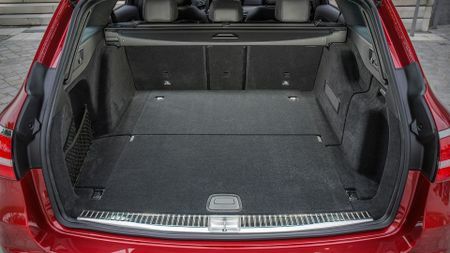 It also has self-levelling air springs at the back, which keep the car level when you’re carrying something hefty, or using its two-tonne plus towing ability. Seats that drop at the touch of a button, a low loading lip, a folding plastic crate for carrying groceries, and even an optional cycle rack strong enough to hold four bikes… the Mercedes has it all covered. It’s not quite as practical when it comes to carrying people, though. Those in the back are treated to generous leg and headroom, but the middle seat is not really useable for adults: it’s narrow, raised, and foot room is impeded by the high, wide transmission tunnel. A Volvo V90 feels wider and more spacious inside, but unlike the Volvo, the E-Class comes with the option (not yet confirmed for the UK) of two child car seats that pop-up from the floor of the boot. This gives it the flexibility that most buyers turn to flagship SUVs for. Yet for all the worthy practicality stuff, it’s not exactly the kind of car you’ll want to get mucky by nipping to the tip in. That’s because its interior is remarkable. 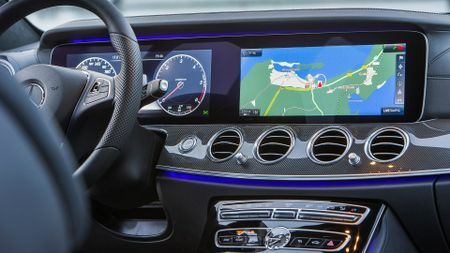 For starters, it looks stunning, particularly with the leather dash and open grain wood on the AMG Line trim. 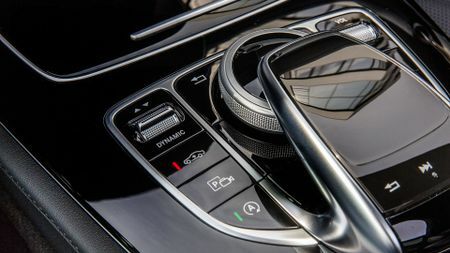 Opt for the Comand Online infotainment package (£1,495) and cockpit display (another £495) and you get dual widescreens that look fantastic, and are controlled using two touch sensitive pads on the steering wheel. Swiping through the menus is complicated at first, but soon becomes second nature, but we wish the sat-nav was quicker and easier to use. 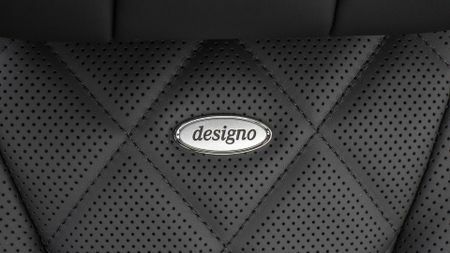 The luxurious interior is perfectly matched by the relaxed driving experience, too. 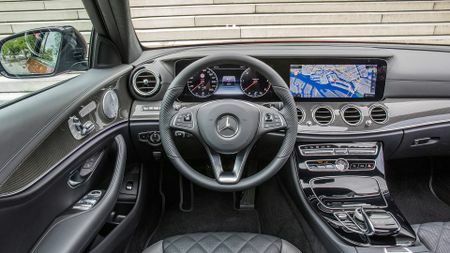 The E-Class is all about keeping those inside relaxed and cocooned from disturbances from the outside world, and this isolation does mean it takes you where you want to go, rather than you driving it there. The 2.0-litre diesel engine is incredibly refined, and can only be heard in the cabin when it’s working really hard. The standard auto gearbox shuffles through the ratios imperceptibly, and it has just enough grunt to make it a stellar long-distance motorway cruiser. All the cars we tried were fitted with adjustable air-suspension, a £1,495 option (standard on the 350d), which softens the ride, so it floats along smooth roads. You can still feel a bit of patter from the 19-inch wheels at lower speeds though, so the SE models, which come on standard 17-inch alloys and fat tyres, should be comfier. 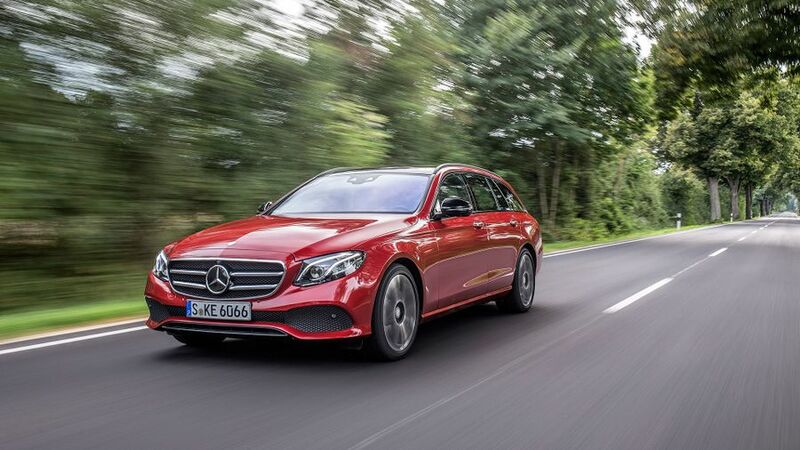 As you’ll be so relaxed driving the E-Class Estate, the rest of the dynamic package could easily pass you by. 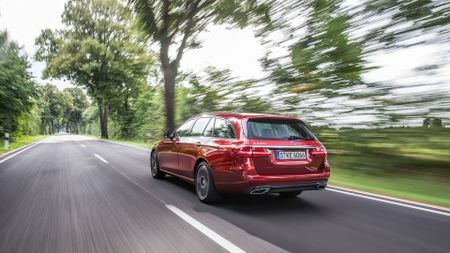 Direct steering, decent grip and reasonable body composure (the estate is 100kgs heavier than the saloon, and you can feel the difference in corners) make the E-Class competent down a challenging B-road, but this is not a car you’re ever likely to take for a drive just for the hell of it. 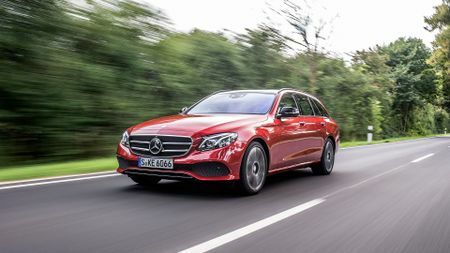 The E-Class Estate has gone from being a one-trick pony with a huge boot, to a polished all-rounder that tops the class in several key areas. It has the biggest boot, most desirable cabin, best gadgets of any of the premium estates, and it’s so easy to drive. 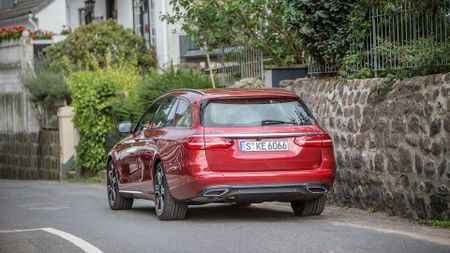 The 220d we drove here is the pick of the range: it’s efficient, refined, and strong enough to feel reasonably quick. 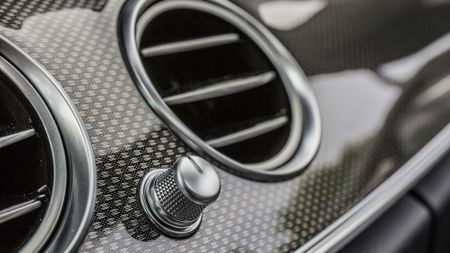 SE models represent better value than the AMG Line version though, with a decent standard kit roster than includes, heated front seats, LED headlights, sat-nav, keyless go, climate control and DAB radio. Basically, if you want the Swiss army knife of family estates, the E-Class should be near the very top of your list. With the ability to carry seven, it’s worth trying even if you’re after a Land Rover Discovery Sport or Kia Sorento, and it drives better than both.